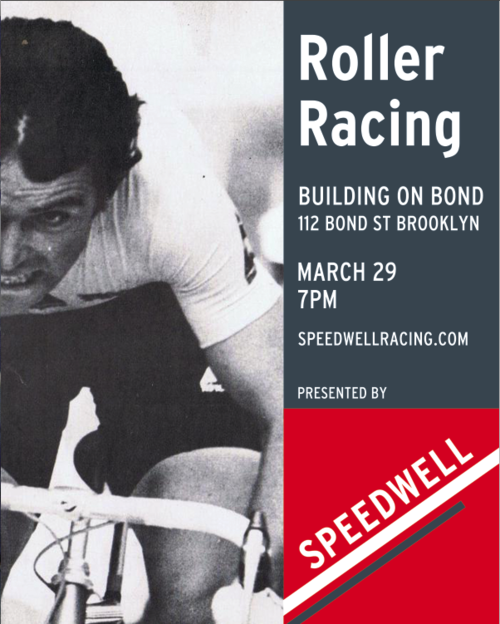 Andrew Greene (love the last name-mine’s without a E) sent me this email announcing an indoor rollers event from Speedwell Racing. Here is a article form a previous Speedwell Racing event in New Jersey. Fastest bike in the bar wins – Roller Racing debuts in Maplewood this week. Speedwell Racing of Maplewood, who most recently brought us Bike Polo Sundays, has announced that they have now organized local Roller Racing events for us to take part in. Debuting tomorrow, Wednesday, February 16th, the races will be held at St. Jamesâ€™ Gate Publick House beginning at 8:00 pm. A second racing session will be held the following week, on Wednesday, February 23rd.